Objective 1: Application of biochar as an additive to anaerobic digestion of dairy manure for H2S reduction and enhanced methane production. Hypothesis 1a: Smaller particle size and higher surface area of the biochar will lead to higher H2S removal due to the liquid phase reaction controlled by available adsorption sites (higher surface area), with higher methane production. Objective 2: Compare H2S removal efficiency between biochar addition into a digester and biochar used in a separate gas adsorption column for H2S scrubbing. Hypothesis 2: Reactions in a biochar column are dependent on biochar pH and will have a higher adsorption capacity when compared to reactions in the liquid phase. In addition, the H2S sorption capacity in a gas adsorption column will follow the trend: corn stover biochar > maple biochar > activated carbon, due to corn stover biochar having the highest pH and activated carbon having the lowest pH. The project will aim to identify the effect of particle size, surface area, and surface charge of biochar from two sources (maple saw dust and corn stover) as well as activated carbon on H2S production when added into a digester and packed into a separate scrubber vessel. It is hypothesized that the dissolved bisulfide (HS-) ions will be adsorbed to the biochar surface, resulting in a lower H2S partial pressure in the gas phase. The project will also aim to compare the H2S adsorption capacities of direct addition of biochar to a digester to H2S adsorption from the biogas when using an activated carbon or biochar filled column as a separate scrubber vessel. Other possible benefits of direct biochar addition could be ammonium N (NH4-N) and dissolved P removal, and possible enhancement of CH4 formation, due to the presence of important trace metals in the biochar required for methanogenesis. It is also hypothesized that biochar addition will reduce P concentration in the digester effluent due to electrostatic forces, and ionic precipitation between the cations on the biochar surface and the dissolved P. The biochar could then act as a slow-release fertilizer for the bound P, when compared to chemical fertilizers (Sizmur 2017). Biogas produced from anaerobic digestion (AD) consists of 55-70% methane, which can be used as a source of renewable energy, but also contains carbon dioxide and traces of hydrogen sulfide (H2S). H2S can corrode the AD vessels and electric generator sets that turn methane into electricity. H2S in biogas can be especially high on dairy farms due to the high sulfur content of the manure (up to 8000 ppm). Market available solutions to high H2S concentrations in biogas can have high capital and operating costs or unpredictable efficiencies. A desulfurization alternative is biochar, produced via thermal degradation of organic material under limited oxygen (pyrolysis) at temperatures between 100 0C and 700 0C (Hale et al., 2011). Biochar could be a cheaper solution for H2S removal, as the raw waste materials used to make biochar, such as agricultural waste, are usually abundant. In addition, the lower preparation temperatures (<700 0C) and no requirement of any activation steps make biochar comparatively cheaper than activated carbon production (Thompson et al., 2016). A few studies have investigated H2S removal from biogas using biochar through physical and chemical adsorption in a packed bed column (Shang et al., 2013; Kanjanarong et al., 2017; Xu et al., 2014). Recent studies have also investigated the direct addition of biochar into an anaerobic digester (Meyer-Kohlstock et al., 2016; Mumme et al., 2014; Shen et al., 2016; Shen et al., 2015; Jang et al., 2018). These studies focused on increasing methane content upon addition of the biochar but did not focus on the effect of biochar addition on H2S production. According to Shen et al. (2015), by adding biochar made from corn stover directly to the anaerobic digester, up to 86% of the CO2 was sequestered, creating a biogas stream that was more than 90% CH4 and less than 5 parts per billion H2S. However, the research was focused on digestion of wastewater and not dairy manure. The experiments were conducted at thermophilic conditions, with a low concentration of H2S that are usually not associated with biogas in dairy manure digesters. The authors added large amounts of biochar (up to 4.8 g biochar/g substrate total solids) into their experimental units, which had 1.3% total solids (TS). In dairy manure digesters, the TS concentration can vary from 1% to 10%, which would result in large amounts of biochar addition to digesters. A lower biochar concentration that adequately desulfurizes biogas, while also providing a measure of CO2 sequestration may be ideal for dairy manure digesters. The study aimed to identify the effect of different biochar concentrations, particle sizes, and surface modification using biochar prepared from two sources (maple wood chips and corn stover) on H2S production, when added into a digester. These three main treatment factors were studied using three independent batch tests. Other possible benefits of direct biochar addition were also investigated, that included ammonium N (NH4-N) and dissolved P removal, and possible enhancement of CH4 formation due to the presence of important trace metals in the biochar required for methanogenesis. Dairy manure (DM) and inoculum for the study were collected from three different sites due to accessibility issues and all three independent batch tests were conducted using a different set of substrate (dairy manure) and inoculum. The study on the effect of biochar concentration on H2S production was conducted using anaerobic digester effluent (inoculum) and unseparated liquid manure samples collected from a covered lagoon digester at Kilby dairy farm in Rising Sun, MD. The farm co-digested 98% (vol) flushed dairy manure and 2% (vol) organic substrates containing cranberry waste, chicken fat, meatball fat and ice-cream waste. The study on the effect of biochar particle size on H2S production was conducted using inoculum and unseparated DM obtained from a mono-digestion system at the USDA Beltsville Agricultural Research Center (BARC) in Beltsville, MD. The effect of biochar surface modification on H2S production was conducted using inoculum and unseparated DM obtained from a mono-digestion system at Mason Dixon farm, Gettysburg, PA. All samples were brought to the laboratory on ice and tested for total (TS) and volatile solids (VS) within 24 hours. Biochar was obtained from the company ArtiCHAR that produces biochar tailored to the user’s requirements. Two biochar substrates were tested: corn stover (CSB) and maple wood chips (MB), which was prepared through pyrolysis under an O2-free atmosphere at 773 K using a pyrolytic chamber, with a holding time of 20 mins at the final temperature. The prepared biochar was characterized using N2 adsorption isotherms for BET surface area, total metals analysis, Fourier transform infrared spectroscopy (FTIR) for functional group identification, SEM-EDS for imaging and surface elemental composition, and pH, as detailed in the analytical tests section. Tests for NH4-N, dissolved P, before and after digestion were conducted to estimate the percentage reductions with and without biochar and activated carbon addition. Corn stover biochar (CSB) and Maple wood chips (MB) biochar at four different concentrations (0.1 g biochar/g manure TS, 0.5 g biochar/g manure TS, 1 g biochar/g manure TS and 1.82 g biochar/g manure TS). For simplicity, the treatments are denoted by the concentration of biochar added and the biochar type, e.g. 0.1 MB for maple wood biochar added to the batch AD system at 0.1 g/g manure TS. 0.5 g biochar/g manure TS was selected to determine the effects of particle size and surface modification of biochar in subsequent experiments. Each biochar was coupled with three different mesh sizes for each treatment: Mesh 20 (0.841 mm), Mesh 80 (0.177 mm), and Mesh 200 (0.074 mm). For each mesh size, the collected particles between the selected mesh size and the next smaller mesh size were selected. For example, for Mesh 20, the particles collected between Mesh 20 and Mesh 40 were selected for the experiment. For simplicity, the treatments are denoted by the biochar type and the mesh size associated with the particle size, e.g. CSB20 for corn stover biochar that passed through the sieve with mesh size 20. Activated carbon (Darco G-60, Fisher Scientific, Ontario, Canada) with a particle size of < 0.074 mm (Mesh 200) was also used as a treatment to compare its effects on CH4 and H2S production to biochar addition (labeled AC200). There were four treatments with one treatment level (unmodified biochar, potassium (K) impregnated biochar, calcium (Ca) impregnated biochar, iron (Fe) impregnated biochar) for both types of biochar (CSB and MB. For impregnation, 10 g of biochar was mixed with the metal chloride (K, Ca and Fe) solution for 12 h, using a magnetic stirrer, and then dried at 105 °C for 12 h. The metal chloride solution was prepared by adding an amount of chemical reagent that corresponded to 0.2 g of potassium, calcium and iron. For example, the KCl (52.5% K, 47.5% Cl) solution had 0.38 g of KCl out of which only 0.2 g was K. The dried composites were rinsed several times with deionized water to remove contaminants that can easily leach out, and then dried again overnight at 105 °C (Fristak et al., 2012). For simplicity, the treatments are denoted by the biochar type and impregnated metal, e.g. Corn stover biochar impregnated with Fe is denoted by CSBFe. Statistical analysis was conducted to determine significant differences in CH4, H2S, TS, VS, BET Surface area, NH4-N, dissolved P, dissolved sulfide and sulfate, and pH using t-tests, analysis of variance (ANOVA) and Tukey–Kramer multiple comparisons. All p-values <0.05 were considered significant. All triplicate values are reported as averages with standard errors (SE). Triplicate samples were tested for TS and VS, according to Standard Methods for the Examination of Water and Wastewater (APHA-AWWA-WEF, 2005) within 24 hours of collection. For TS analysis, triplicate 10.0 ml samples were pipetted into pre-weighed porcelain crucibles. The samples were then dried at 105 0C until a constant weight was obtained for the TS concentration. The crucibles were then placed in a furnace at 550 0C until a constant weight was obtained to determine VS concentration. Biogas samples were collected in 0.5 mL syringes and tested on an Agilent 7890 gas chromatograph (Agilent, Shanghai, China) using a thermal conductivity detector (TCD) at a detector temperature of 250 0C and the oven temperature at 60 0C with He as the carrier gas. The average CH4 production in the triplicates from the inoculum control was subtracted from the other treatments to present the total CH4 production from the waste substrates only. All cumulative CH4 and H2S data is presented as normalized by VS.
FTIR spectra of the biochar samples were obtained using a Nicolet Nexus 670 spectrometer (Thermo Scientific, Madison, WI) equipped with an attenuated total reflection (ATR) accessory at room temperature, and a KBr splitter. The biochar samples were placed in close contact with the surface and the diamond crystal with the help of a pressure tower. The spectra were obtained over 128 scans with the ATR method, set at a resolution of 4 cm-1, ranging from 4500 to 650 cm-1. Nitrogen adsorption isotherms were measured at 77 K using a BET Analyzer (ASAP2020 Micromeritics, Norcross, GA) for the biochar samples. The samples were heated to 423 K and degassed under a vacuum of <5 µm Hg for six hours. The adsorption isotherms were used to calculate the specific surface area, SBET (BET method) in the range of 0.1 < p/p0 < 0.55, and micropore volume Smicro (t-plot Method). The topographic analysis and the elemental composition of the biochar surface before and after modification, and after completed digestion was carried out by scanning electron microscopy (SEM-EDS) with a magnification range between 2000x and 10000x using a XEIA3 FIB-SEM (Tescan, Czech Republic). Biochar samples were mounted on a stub and gold coated prior to viewing. 10 mg of biochar samples were added to 100 mL of deionized water. The solution was agitated on a shaker for 24 h at 298 K. The zeta potential was measured using a Zetasizer Nano ZS90 (Malvern Instruments, Westborough, MA). The point of zero charge (pHpzc) was determined by multiple measurements of z as a function of equilibrium pH. The suspension pH was adjusted with the addition of 0.05 M HCl and 0.05 M NaOH to measure z as a function of pH. The biochar was tested for total nitrogen, total metals (Iron, Zinc, Calcium, Potassium, Sodium, and Magnesium), total phosphorus and total sulfur at Agrolabs Inc, Delaware using ICP-MS (Inductively coupled plasma mass spectrometry). For ammonia-N, samples before and after digestion were acidified to pH < 2, and centrifuged at 15000 rpm for 30 min. 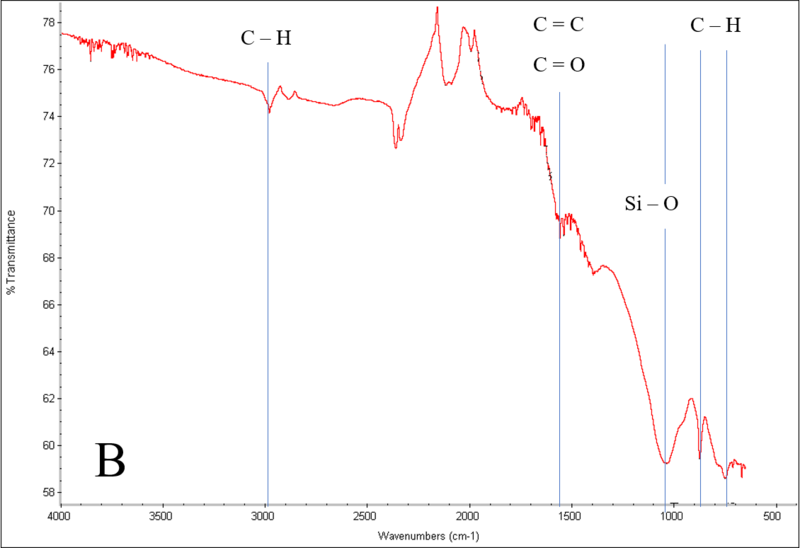 The supernatant was filtered through a cellulose acetate membrane with pore size of 0.45 µm to obtain a filtrate that was analyzed for ammonium-N using a Lachat Quikchem 8500 (Method 10-107-06-2-O; Lachat Instruments, Loveland, CO). For dissolved phosphorus, post digested samples were filtered first with 0.45 µm membrane filter to prevent possible dissolution of adsorbed P and then acidified to pH < 2. The samples were then digested with concentrated sulfuric acid and tested for total phosphorus using the Lachat Quikchem 8500 (Method 13-115-01-1-B rev 2006) to obtain the dissolved P fraction. The mineral composition of CSB and MB, shown in Table 1, illuminates how different biochars prepared from different raw materials exhibit different mineral compositions. MB had a substantially lower pH, iron (Fe), magnesium (Mg), potassium (K), nitrogen (N) and phosphorus (P) content than CSB. SEM-EDS image of MB is shown in Figure 1. The EDS data verified that the biochar is primarily composed of carbon with smaller amounts of calcium, magnesium and oxygen. CSB and MB had a BET surface area of 23.506 m2/g and 161.220 m2/g respectively, while they had a micropore volume of 0.01095 cm³/g and 0.09535 cm³/g, which are similar to the results seen in literature for these two biochar types (Rajapaksha et al., 2016). 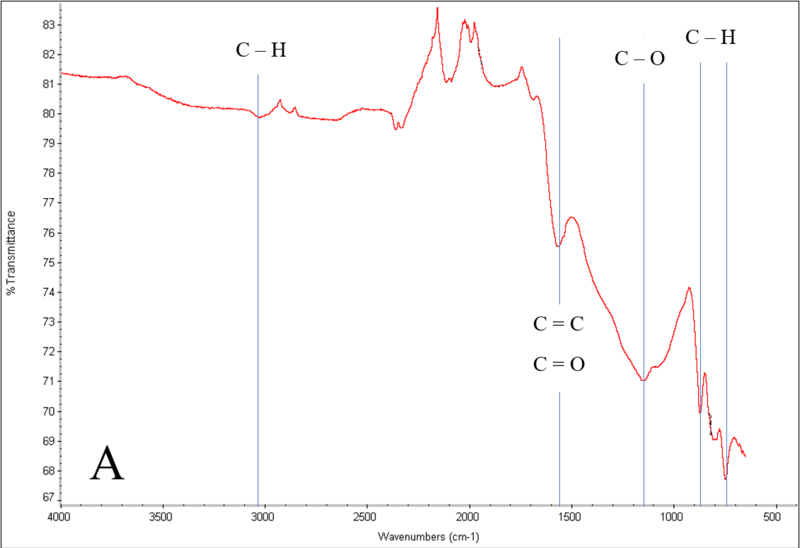 The peaks in the FTIR spectra (Figure 2) at 2950 – 2850 cm-1 show the aliphatic C-H stretching while the aromatic C – H, C = C, and C = O can be seen at 750 – 900 cm-1, 1380 – 1450 cm-1, 1580 – 1700 cm-1 for both CSB and MB. The hydroxyl group band (3200 – 3400 cm-1 is almost non-existent which can be seen in biochars prepared at temperatures above 500 0C (Jindo et al., 2014). The increase in the presence of aromatic functional groups compared to aliphatic groups is also observed more often at temperatures between 500 – 700 0C. In this case, the intensity of the peaks in the aromatic range is higher than the intensity of the peaks in the aliphatic range. An important difference seen in the two biochar types is the presence of an intense Si – O peak in CSB (1050 cm-1) but not in MB, since hardwoods have a much lower silica content than corn stover (Brewer et al., 2009; Ragland et al., 1991). Fig 1. 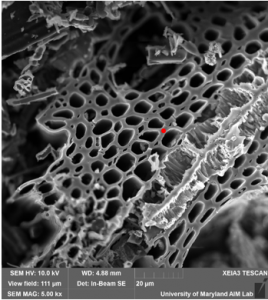 SEM image of maple wood chips biochar (top) with the EDS data (bottom) showing the elemental distribution at a point (marked red) on the biochar surface. Addition of different biochar concentrations into the reactors did not lead to any significant differences between the treatments in terms of CH4 production. The cumulative methane production varied between 231 ± 6 mL/g VS (0.1 CSB) and 201 ± 2 ml/g VS (1.82 MB) when normalized by the grams of VS added. Different particle sizes of biochar and biochar impregnation did not appear to impact the CH4 production in a significant manner (Figure 3). However, addition of activated carbon led to a significant increase (10.7%) in the normalized CH4 production (445 ± 3.15 mL CH4/g VS) compared to DM (402 ± 3.42 mL CH4/g VS). Previous studies have attributed this enhancement in CH4 production to direct interspecies electron transfer (DIET) (Park et al., 2018; Zhao et al., 2018). Additionally, the AC treatment also led to a rapid increase in the initial CH4 production rate (shorter lag phase). Conventionally, IET or interspecies electron transfer is the primary route for methane production where hydrogen acts as the electron carrier between fermentative bacteria and methanogenic archaea (Park et al., 2018). Fermentative bacteria produce hydrogen by breaking down volatile fatty acids and hydrogenotrophic methanogens use that hydrogen to reduce CO2 and produce CH4. Several authors studied the addition of granular activated carbon (GAC) in anaerobic cultures and proved that using conductive materials can bypass the use of hydrogen as the indirect carrier of electrons by promoting direct transfer of electrons (Park et al., 2018; Cheng and Call, 2016; Liu et al., 2012). DIET has resulted in shorter lag phases, and increased CH4 production from anaerobic digestion, in addition to other benefits such as higher resistance to AD inhibition. However, a primary concern of adding GAC to anaerobic digesters is safety and pollution concerns with post digestion use of the effluent (Jang et al., 2018). To overcome this issue, some authors have investigated the use of biochar to promote DIET and found increased CH4 production rates (22.4 – 40.3 %), shorter lag periods (27.5 – 64.4%) and increase in CH4 concentrations (~ 10%) (Wang et al., 2018a; Wang et al., 2018b) at concentrations varying from 4 g/L to 15 g/L. The present research did not show any improvement in lag times which could be due to the preacclimatized substrate used for each experiment in comparison to the previous studies. The amount of biochar added in the present study varied from 0.28 g/L – 9.2 g/L which was within the range seen in published literature focusing on DIET. An important controlling factor for DIET is the conductivity of the added biochar/GAC. Biochar used in the current study was prepared at 550 0C with conductivities ranging from 7.7 µS/cm for MB to 15.4 µS/cm for CSB whereas biochar produced at temperatures > 700 0C can have conductivities ranging from 0.5 – 2.3 S/cm due to the increase in graphitic structures (Yu et al., 2015; Yuan et al., 2017). This is also supported by results from authors showing that biochar prepared at 900 0C – 1000 0C led to a 28.9 – 30.8% increase in CH4 yield while biochars prepared at 550 0C – 650 0C led to a slight increase or no change in CH4 production (0.1 – 5.1%) (Meyer-Kohlstock et al., 2016). Figure 3. Cumulative CH4 production with different biochar concentrations (A), particle sizes (B) and metal impregantions (C), where dairy manure control is denoted by DM, corn stover biochar treatments are denoted by CSB and maple biochar is denoted by MB. The different biochar concentrations (0.1, 0.5, 1, 1.82 g biochar/g manure TS), sieve mesh sizes for different particle sizes (Mesh 20, 80, 200) and type of metal impregnation (K, Ca and Fe) associated with the biochar type are used to differentiate between each treatment. FUTURE WORK: H2S results to be analyzed and column experiments for Objective 2 to be completed in 2019. Preliminary results on the effect of different biochar concentrations on biogas desulfurization was presented at the US Biochar Initiative (USBI) conference held at Wilmington, DE (Aug 20 – 23, 2018), USBI conference 2018. The audience present at the conference included academics, students, producers, anaerobic digestion practitioners and consultants working with farmer owners with anaerobic digester systems on their farms. The results were disseminated with the people present at the conference during networking events. Follow-up correspondence and meetings were also held with government officials and consultants willing to know more about this research and its applicability in the future.